I am writing to you from Bukavu Eastern Congo. I have been here for 7 weeks now staying at the Swedish Mission which is a mission station that was built by Scandinavian Missionaries 60 years ago. The Lord has helped us in so many ways to reach many in the city and below is a short report. There have been many battles and many victories. It was a big battle to get the equipment in but after many days the Lord undertook for us and the truck and equipment crossed the border from Rwanda into Bukavu. Before you read the report below I have to write about an incredible team of believers that have been part of the many outreaches to the city. At some meal times we were more than 30 people, all from different parts of the world but with an all-consuming passion to reach the lost in Bukavu. There was the team from Australia headed by Jack Haynes from Imagine Nations Church. There was the team from Malawi headed by Jamie Peters. There was the team from Nairobi Lighthouse headed by John Magangi and there was our ever enduring faithful to the end team of Congolese brothers and sisters led by Bishop Uwezo who have stood with me through thick and thin. These amazing people were sent by the Lord to help us and together we are able to write to you of the many outreaches by the grace of God we have done. We still have 2 more weeks here and our second crusade is next week. Please pray for us. 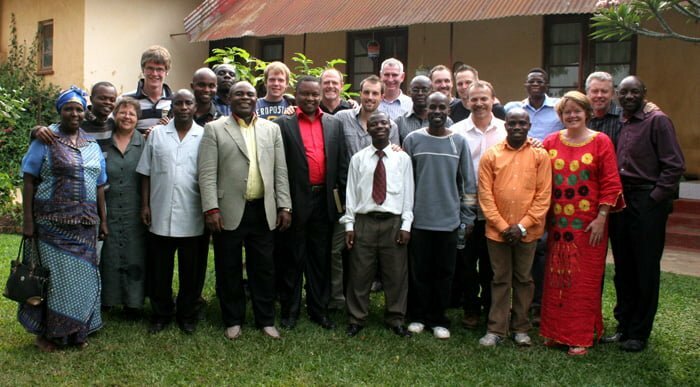 The people of Bukavu need Jesus Christ as their Saviour. 1250 prisoners slowly came out of their cells and gathered with some reservation. We had set up a little sound system and John Magangi from Nairobi Lighthouse Church preached a powerful word. The Holy Spirit gripped the prisoners’ hearts. The response was overwhelming and many received Jesus Christ as Saviour. The prisoners were then given a gift pack of personal effects and also a huge meal of meat, rice and potatoes, which was prepared by Mama Pauline and her team. The ladies was allowed to go into the women’s section and pray with them and provide special gifts for each of them. We also went to the teenager section and met a 12‑year‑old inmate. Every prisoner and every guard was impacted by the love of Christ and the power of the Gospel. Dinah’s Sister’s Home cares for 70 troubled, abused and hurting women and approximately 50 children. Our ministry teams were able to pray for these women, and it was wonderful to see the Comforter the Holy Spirit touching broken-hearts. We were able to give each mother a love gift pack and a small amount of cash to enable them to buy something for their children. A crèche takes care of the children during the day, while the mothers go out and work and in the evening they collect their children. These women were so touched at the love showed towards them that they spontaneously took up an offering among themselves and made us each a beautiful shirt. Roger spoke very clearly on Samuel and Eli. Samuel was the solution, whereas Eli was the problem. It was a convicting message, bringing much needed correction to the Pastors. The senior pastor of the church had been bedridden and very ill. However, he managed to get up and attend the meetings. At the end of the first day, we laid hands on him and prayed for him. The next day, he was much improved and by the weekend, he was back in his office having a meeting with all of his elders. Pastor Jack Haynes and Roger taught and preached the Word of God for over six hours in total. There was an openness and desire to obey the word of God. We prayed for many to be baptised in the Holy Spirit. I believe God is raising up a remnant of believers in Bukavu that will not settle for compromise and will be the glorious church shining without spot and wrinkle and ready for the return of our Lord Jesus Christ. While we encouraged people to join the local churches, we felt that there was much more that we could do to get the new believers established in their new faith. It was then, during one early Morning Prayer meeting that the Lord dropped an idea into our hearts – Radio! We have now booked prime time just after the main news and each night at 9pm Charlene Harris is teaching a new believer’s class on the local FM radio station for the next 5 days. We will take these new believers teachings on with us to the next towns and play them the week after we have held the crusades. This is a great way to follow up the new converts. Just about everybody here has a small radio. We announced the radio frequency and the times and encouraged many to listen in. Praise the Lord His word is going forth. Our visiting teams and the local Congolese brothers and sisters went out on the streets and to the markets. One team saw a lady sitting across the street looking rather despondent. They crossed and boldly asked her if she knew what would happen to her if she were to die. Her response was very direct; “Yes”, she said, “I would go straight to hell”. They started ministering to her, and after many tears she was gloriously born again. Peace flooded her troubled heart. The teams prayed for many in the homes. One team gathered a crowd of more than 100 people gave an altar call and prayed for the sick. We called them the “Sandwich Preachers” as they wore billboards with the Crusade Poster on the back and front of the billboard. 20,000 handbills were given out and people invited to the crusade. It was a wonderful time to see the teams out on the streets going to where the needy were. This is what Jesus told us to do, to go to the highways and byways and compel them to come in. Pure drinking water in Bukavu comes at a premium. Many widows are not able to provide pure drinking water for their families. We were able to provide four widow groups with a very effective filtration system that provides clean and safe water for many families. The venue could not have been better. We were right in the middle of gangsters, thieves and bars. Very few church people attended the meeting! It was wonderful that the main attendance was by un-churched people. The simple Gospel message convicted hearts. It seemed as though nearly every hand shot up on the field. Many prayed the prayer of salvation each night. The gospel was clearly presented. We preach the Lord saves. Healing flowed like a river setting many free and healing many suffering. One man had suffered with severe back pain and was forced him to wear a body brace. He removed it, and bent over without any discomfort whatsoever. We battled rain every day. The field was extremely wet and muddy, and yet the people still came, night after night. On the final night, I could see a huge storm approaching, but not getting any nearer. It was as though an invisible hand held it back! As we closed in prayer, flashes of lightning struck and the biggest raindrops I’ve ever seen began to fall. In moments, the field was empty. It poured and poured. God had graced us and held the rain back so that His Word could go out. What a victory God had given us.